Reel Asian and Andil Gosine‘s Wardrobes join forces to support the North American premiere of Dal Puri Diaspora with a special film-and-event package! Reel Asian is excited to include a preview of Andil Gosine‘s Wardrobes art-fashion project in support of the North American premiere of Richard Fung‘s Dal Puri Diaspora. In his film, director Fung introduces Canadian audiences to Gosine’s work, and filmgoers will get the chance to travel deeper into the art-fashion project at a special “Lime” (Trini slang for a “hangout”) event after Dal Puri’s North American premiere at Reel Asian. A special $30 film-and-event package ticket gets you admission to both the Dal Puri Diaspora screening (4:30 PM at the Royal, 608 College St) as well as the Rum and Roti Lime (6:00 PM at the Monarch Festival Hub, 12 Clinton St), the post-screening art experience. Attendees enter to a carefully curated selection of Trinidadian calypso, soca and chutney music, and pick up their free rum-based welcome cocktail at the bar (non-alcoholic alternative available). After watching a film about roti, you’ve got to have one – and event co-producers Lettie Gariba and Adam Barnes will be serving up yours (vegetarian available upon request) from a customized “Roti Shop” created with industrial designer-artist Kara Springer. This “Roti Shop” will also showcase two items from Gosine’s collection, the “Cutlass” brooch and “Rum and Roti” – a bag Gosine designed with Skinny Vinny of Brooklyn that appears in the film! This will be the premiere exhibition of the bag in Canada, and the first time its limited run of 25 will be on sale. Throughout the duration of the Lime, the art performance A Map of Pleasure, A Map of Grief will unfold, with individual participants invited by Gosine to respond to a series of questions which are then turned into maps by guest artists Gyimah Gariba and Joshua Vettivelu. Gariba’s artwork (shown above right) was produced in limited quantities expressly for this project. At the end of the night, participants get to take their maps home. There’ll also be other little surprises in store! 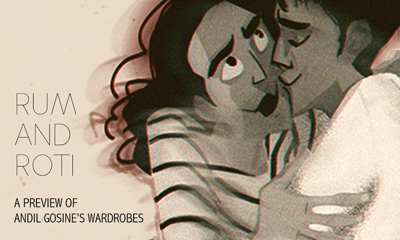 Gosine describes Wardrobes as an exploration of how migration impacts experiences of intimacy. “It’s a longer story of desire,” he says, “a story about living in between the feeling that no where is home, and everywhere might be home.” Richard Fung’s search for roti, he adds, “is about his living in this space.” Wardrobes began life as a series of art objects Gosine created and premiered at the New York Institute of Fashion, and later developed into a series of art performances and a play that elaborate each object’s story. 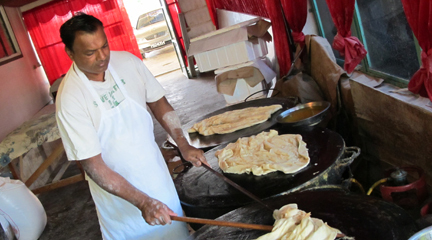 Rum and Roti is the second of four art happenings to take place in Toronto over 2012-13. Tickets to the screening are available separately; however, admission to the Lime event is ONLY available as part of this bundled package. This film-and-event package is sold exclusively in advance and online – no tickets will be sold thru TO Tix, at the door, or via the festival’s future-day sales desk. Limited quantities – act soon to avoid disappointment.